Cleveland Police Officer Jeff Stanczyk delivers materials for the children. 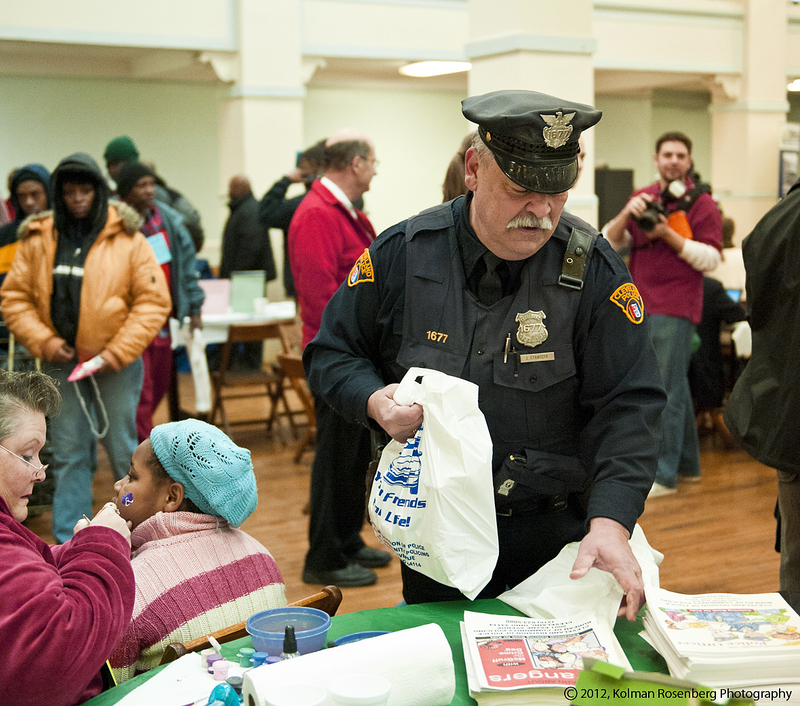 This past Sunday HandsOn Northeast Ohio sponsored the annual Homeless Stand Down at Cleveland’s Masonic Auditorium. As a member of the Cleveland Photographic Society clevelandphoto.org , I was there to assist in taking photos and providing professional quality portraits for the participants. While I was shooting near the entrance, in walked a Cleveland Police Officer who immediately attracted everyone’s attention. Homeless participants, volunteers, the media, and children all seemed to gravitate to Cleveland Police Officer Jeff Stanczyk. I immediately sensed that this was a very special person! I followed Officer Stanczyk for a few moments and one homeless participant, watching me, said to me, “Be carefull or he’ll invite you to his retirement party.” I decided right then and there that I wanted to talk to this guy. He was kept quite occupied by people and I thought I’d try to catch up with him later. An article published on cleveland.com http://blog.cleveland.com/metro/2012/01/volunteers_lend_a_hand_at_home.html?utm_source=dlvr.it&utm_medium=twitter mentioned that Jeff had been circulating amongst the crowd doing rope tricks. 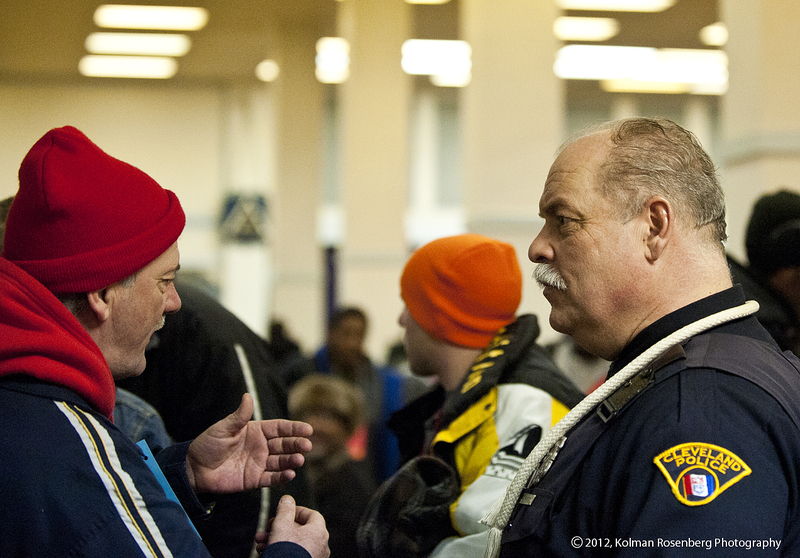 Officer Jeff Stanczyk talks with a Stand Down participant. I finally caught up with Jeff a few hours later and said to him, “I heard you were planning to retire?” We struck up a conversation and he told me that he had approximately 13 months to go. He said he was feeling it was time to move on to new adventures. In talking further I learned that Jeff had worked all of the Cleveland Browns football games for 30 years and had recently worked his last game. He had watched Browns fans who he first saw at the age of 5, grow to adulthood and who now bring their children to the games. Fondly he told me that the Browns had provided him with the opportunity to go into the stands and say farewell to many of these fans during his last game. I found on Google that Jeff works with the Community Relations Unit of the Cleveland Police Department and it certainly didn’t surprise me. Here is a man who embodies the what all of us believe a police officer should be, and most are, I might add. In just talking with him for a few minutes I could see why he seemed to be known and respected by all. I felt like we were old friends. When Jeff Stanczyk retires, the Cleveland Police Department will lose a real treasure. I will wish him the best and I salute his service! This entry was posted in Uncategorized and tagged Browns, Cleveland, Cleveland Browns, cleveland photographic society, Cleveland Police Department, clevelandphoto.org, Down, Fans, HandsOn Northeast Ohio, Homeless, Jeff Stanczyk, Jeffrey Stanczyk, OH, ohio, Police Officer, Retirement, Salute, Stand, Stand Down. Bookmark the permalink. Thank you Dave! I appreciate the comment. I posted this originally on January 25, 2012 but recent events have brought me back to it and I think it important to re-post it. I think most of us believe that most police officers are great people and we all appreciate what they do for us. Unfortunately the few bad apples get all the attention and lately many of those bad apples are dominating our news sources. As I re-read this I had forgotten Jeff Stanczyk’s connection with the Cleveland Browns and in respect to the Cleveland Police Union President’s remarks yesterday, it just seemed that maybe they should beg Jeff Stanczyk to come out of retirement! We need more Jeff Stanczyks in every police department!